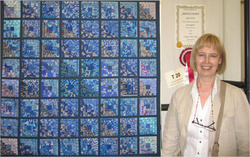 I would like to first of all thank you for awarding me with the South West Quilters Trophy for traditional patchwork. Considering this was my first quilt ever I was really taken by surprise. I was introduced to the Malvern Quilt Show ten years ago when I began buying ikat patchwork pieces. These were from a stand called Textile Traders who source their materials from the Far East. I would buy one or two packs each year I visited the show, and made them into log cabin patchwork. On seeing the theme this year at Malvern I thought it would be a great opportunity to put all my squares together to make a quilt. A friend of mine last year sent me a birthday card from the Quilt Museum in York and it gave me the idea of how to join all my squares together. I had always wanted to show a quilt at Malvern so was determined to do it for 2011. Although I do sew for a living I have no background in quilting. For a living I make men’s costumes for the Royal Shakespeare Theatre hence the title of my quilt To Quilt or Not to Quilt. Over the last seventeen years with the RSC I have worked with many designers one of them even being Kaffe Fassett. I feel very fortunate to work in such a creative environment.